Heat oven to 350°F. Spray 9 regular-size muffin cups with cooking spray. Remove cookie dough from wrapper. Spoon 1 tablespoon dough into each muffin cup. With fingers, press dough to flatten in cups. Place 1 teaspoon chocolate chips on top of dough in each cup. Place additional 1 tablespoon dough over chips in each cup; press lightly to flatten. Bake 20 to 25 minutes or until tops are golden brown. Cool in pan about 10 minutes. Remove warm cookies from muffin cups. 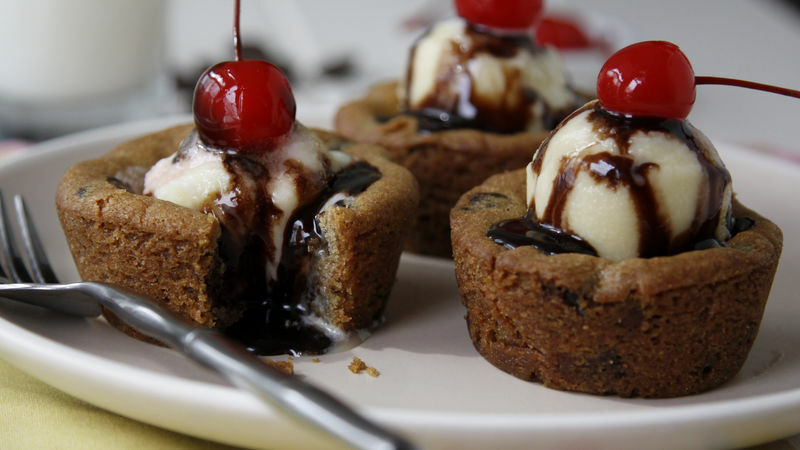 Top each with ice cream, chocolate syrup and 1 cherry. Cookies will keep in an airtight container for a few days. You can reheat cookies in the microwave to warm slightly prior to serving.